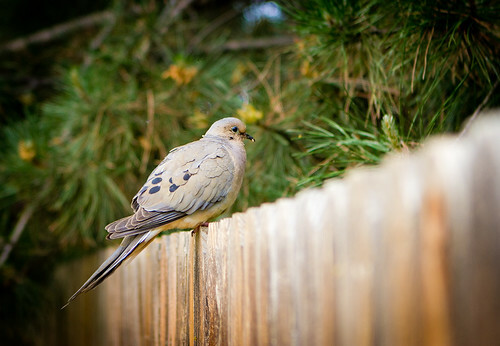 This Mourning Dove flew into our yard and was almost too brazen. Sat on the patio eating stuff. Only til I got out the leaf blower did he fly over to the bird feeder where he/she stayed for 30 minutes just pecking around eating food. I was nearly a foot away from her the entire time and she barely flinched. Then my daughter scared her onto this fence where I was able to sneak up and get a decent close-up. Birds! !